As a Lasallian Catholic learning community, we at Cristo Rey De La Salle East Bay High School believe in the power of a progressive, transformative, and relevant education. We have partnered with Summit Learning and New Classrooms Teach To One: Math to enhance our student centered personalized learning experience. The basic tenets of our model are aligned with the Core Principles of a Lasallian Education. Respect For All Persons: One-on-one mentoring for every student associate. Every student associate has a mentor at school. Students work closely with their mentors to set goals and to realize a sense of purpose through their work. Teachers develop strong relationships with students to understand their passions, interests, and aspirations and how they can work to achieve those learning goals. Concern For Poor and Social Justice: A focus on real-world projects that build cognitive skills and core knowledge. The Stanford Center for Assessment, Learning, and Equity identified 36 cognitive skills as most critical for college and career readiness. Our student associates develop those cognitive skills and core knowledge through real-world projects whose focus is on making our local and global communities a better place while contributing to the common good. Inclusive Community: Multiple learning modalities that allow students to learn in different ways. 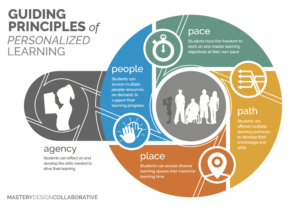 We embrace three learning modalities that give students and teachers the flexible learning environment they require in order to meet their learning goals. The Leveled Learning modality is an independent learning zone where students work on skill proficiency or lesson reinforcement through practice. The Guided Learning modality is where teachers help to guide students through new skills or knowledge acquisition. The Collaborative Learning modality is where students engage in peer-to-peer or small group learning. Quality Education: Qualified teachers along with relevant and rigorous content that meet our student associates’s needs. All of our teachers are highly qualified and trained in personalized learning and bring a diversity of experiences to bear in the classroom. In addition, our course content is relevant, rigorous, and designed with the best pedagogical practices in mind. Faith In The Presence of God: Each student associate is made in the image and likeness of God and is a unique individual with their own gifts and talents that need nurturing. The personalized learning experience is a way for us to nurture a student’s individuality within a community of learners who strive for competence and mastery. We acknowledge that each student learns at different speeds and in different ways and what works for one may not work for another. We know that what students learn has to be important to them.